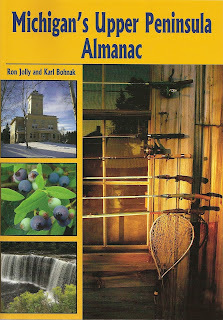 For Upper Peninsula devotees, the newly published Michigan’s Upper Peninsula Almanac is a must have. Put together by Ron Jolly, a Traverse City radio broadcaster, and Karl Bohnak, an Upper Peninsula meteorologist, and published by The University of Michigan Press, the Almanac is a hefty 580 pages, and provides almost more than enough information. There are plenty of numbers and statistics, which often tell us what we already know – the U.P. is cold and snowy in the winter and it can be hot in the summer. But there are some real nuggets of information, such as the name “Cloverland,” which an Upper Peninsula newspaper man used to describe the region in an effort to attract farmers and stock raisers. Not much has escaped the notice of the authors, including the exclusive Huron Mountain Club northwest of Marquette, which has long been a retreat for Midwestern business tycoons, including Harvey Firestone and Henry Ford. The club along the shores of Lake Superior has 30,000 acres and is limited in membership to about 50. The Almanac features a section on well-known Upper Peninsula residents, and while many people know that George Gipp, the Notre Dame player made famous by the movie line “win one for the Gipper” was from the Calumet area, it also takes note of the lineman who played on the same team and was a blocker for the Gipper. He was one Hunk Anderson who was born in Hancock and graduated from Calumet High School. The Hunk eventually made it to the NFL and eventually was head coach at Notre Dame during the 1930s. Jolly and Bohnak have really done their homework on this one. The actress Doris Packer, no her name wasn’t ever on a movie marquee, played the principal of Grant Avenue Grammar School on the “Leave it to Beaver” television series. Packer was born in Menominee in 1904 and later moved with her family to California. The are many Mackinac Bridge facts, which include the famed Yugo that when over a side rail and plunged 150 into the Straits during a blizzard in September, 1989. But there’s also the story of an Air Force pilot who flew his $3.5 million jet under the bridge on April 24, 1959. The pilot, John Lappo, of Muskegon, said at the time he had a life-long dream of flying under a bridge. There’s also a section on how various U.P. towns got their names, and my favorite is the Baraga County town of Covington. Seems that when it came time to name the community in the late 19th century, nobody could come up with a name, so in the spirit of the times, they looked to the bottle – a whiskey bottle -- for inspiration. On the bottom of the bottle was the name where the whiskey was made – Covington Kentucky. So the town was born. Perhaps those who name the subdivisions where many of us now live could use some of that inspiration, and maybe we’d have Jack Daniels Acres instead of Quail Ridge, or something equally as silly.